A newly installed critical cable system experiencing multiple cable and accessory failures shortly after commissioning. The sites' underground cable system had initially been tested using a very low frequency (VLF) method, but after multiple cable and accessory failures, the owner consulted the cable manufacturer about the problems they were experiencing. The cable manufacturer advised the owner to conduct a thorough PD test of the cable system to verify the system quality and identify problems. 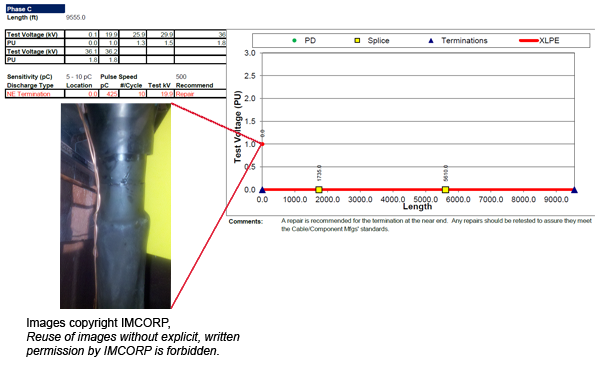 IMCORP’s Factory Grade® technology found many substandard PD sites in the cable insulation and multiple improperly installed accessories. The issue found with one separable connector was that the cable adapter (the stress control element) was not in contact with the cable semicon cutback. This dimensional error effectively voided any electrical stress grading functionality, resulting in substandard PD activity which would likely end in future system failure. The site owner indicated that some of the failures after the VLF test were precisely at the same location on other terminations. Once the installation issues were identified, the site owner made the appropriate repairs and had IMCORP reassess the repairs to confirm the workmanship. By using IMCORP’s Factory Grade® assessment, this cable system owner was able to upgrade their cable system to meet manufacturers’ specifications.